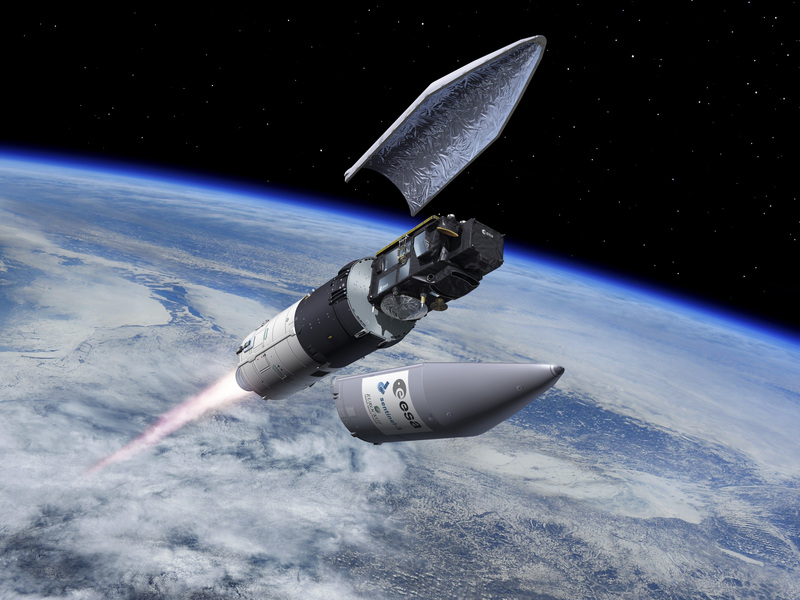 Europe’s Copernicus satellite fleet is gearing up for the arrival of its next addition on Wednesday with a Russian Rockot booster set to blast off from the Plesetsk Cosmodrome at 17:57 UTC carrying the Sentinel-3B multi-function satellite. Pending successful delivery into orbit, the 1,250-Kilogram satellite will fly at 140-degree separation to its twin launched in 2016 to collect a comprehensive set of ocean and land observation parameters feeding into the data record collected by the Copernicus satellite fleet. Sentinel-3B was installed atop the 29-meter tall Soviet-era ballistic-missile-turned-space-launcher on Saturday in preparation for Wednesday’s launch on a one-hour and 20-minute climb into an 800 Kilometer orbit. This launch will mark the beginning of the end for Rockot as the vehicle is set to fly out its 24-year career as an orbital launch vehicle this year, lifting Sentinel-3B, a pair of Russian defence ministry payloads and a trio of Gonets-M communications satellites. Sentinel-3B will be the seventh satellite launched under Copernicus, joining two Sentinel-1 Synthetic Aperture Radar Satellites, the Sentinel-2 high-resolution imaging satellites, the Sentinel-5 precursor for atmospheric monitoring and the first Sentinel-3 satellite. 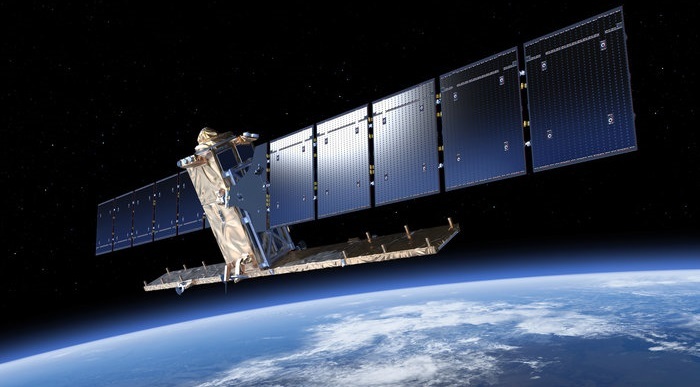 Operated as a joint venture by the European Commission, the European Space Agency and the European Weather Agency Eumetsat, the Copernicus/GMES program has the primary objective of collecting and making available a comprehensive set of Earth observation parameters collected by different instruments embarked on several satellite missions as well as other data sources like airborne terminals. To accomplish its goal, Copernicus is to consist of ten different satellite types with an overall program cost of 6.7 billion Euros through 2020. Sentinel data is processed into a variety of products of relevance to the scientific community, useful for operational capabilities like weather forecasting and environmental monitoring, and employed by policy-makers to guide their decisions with respect to environmental regulation, urban planning, etc. 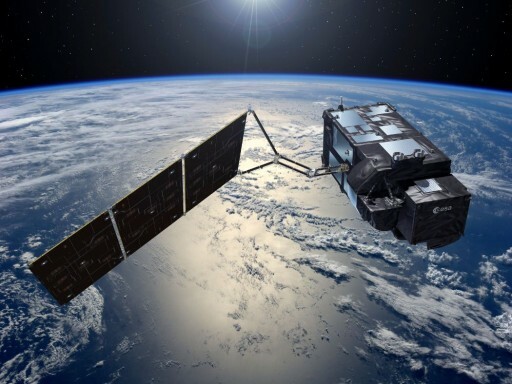 Built by Thales Alenia, the Sentinel-3 satellites are considered the most comprehensive of the fleet since they fly with a package of several instruments for data collection on land and ocean parameters, unlike the Sentinel-1 & 2 missions that host a single, specialized instrument. 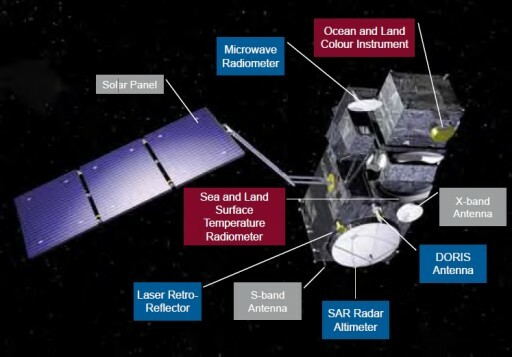 Combining an Ocean & Land Color Instrument, a Surface Temperature Radiometer and SAR Altimeter, Sentinel-3 collects high-resolution land and ocean surface color data, ocean and land temperature measurements, surface topography data over land and ocean and data for vegetation assessments, ice monitoring, atmospheric studies and fire detection, Additionally, the mission provides data continuity for heritage missions to extend multi-decade records of ocean altimetry and surface temperature. 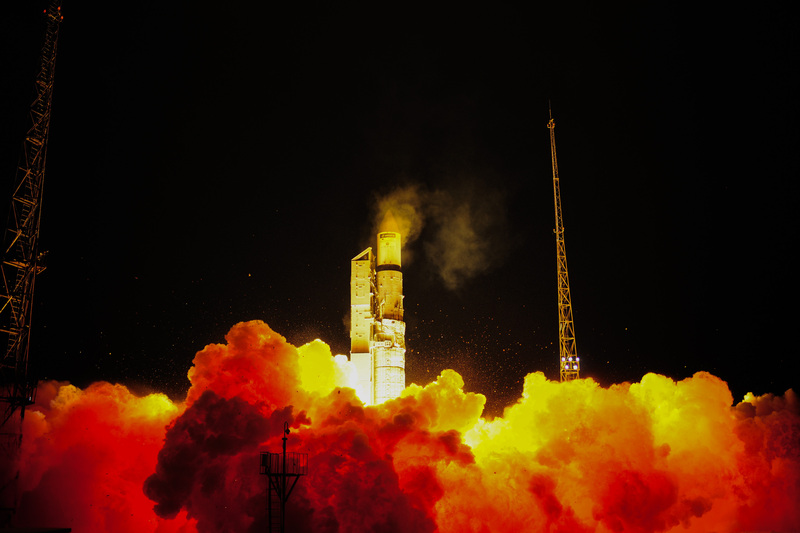 Sentinel-3A lifted off from Russia’s prime military launch site on February 16, 2016 and currently operates from an orbit of 802 by 803 Kilometers, inclined 98.63 degrees. 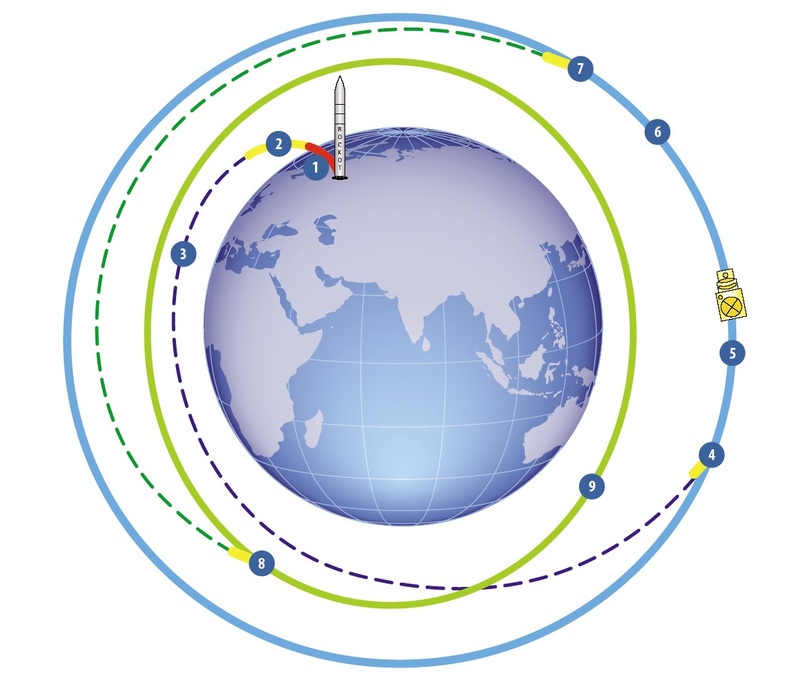 Wednesday’s Rockot/Briz-KM launch is targeting a near-circular injection orbit of 810 Kilometers, inclined 98.65 degrees from where the satellite will use its own engines to join Sentinel-3A at an in-plane phase angle of 140 degrees in a setup optimized to cut the revisit time of the two-satellite constellation to less than two days. Another two satellites are on order to join the constellation in the first half of the 2020s to increase revisit time and ensure data continuity. In contrast to the other Copernicus missions, Sentinel-3 operates in a more operational capacity in that a fast data processing pipeline will deliver processed data products in a timely manner to be used in marine forecasting, ice monitoring and ocean current assessments. This is accomplished with a largely automated ground system for data processing and distribution as well as data dumps from the satellite on every orbit of Earth. 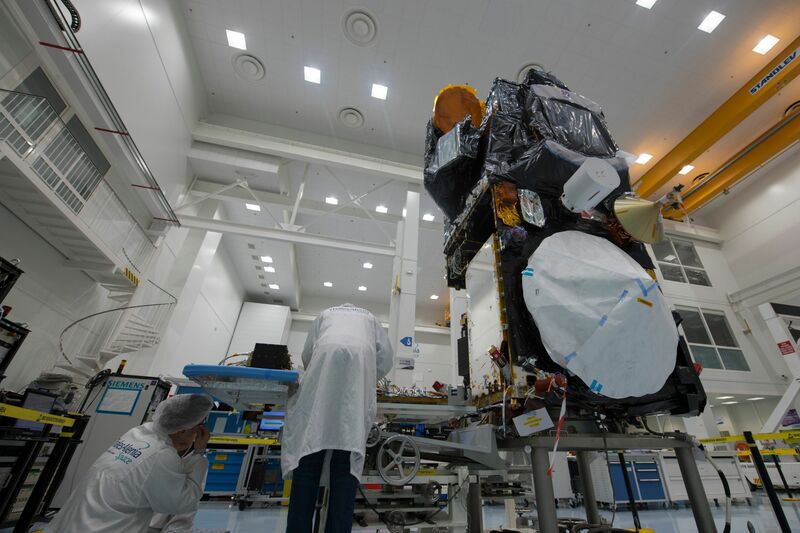 The Sentinel-3 satellites are outfitted with two imaging payloads and two topography instruments. The Ocean and Land Color Imager is a pushbroom imaging instrument comprised of five cameras covering 21 spectral channels to deliver detailed land and ocean color data as well as fire detection, vegetation data, atmospheric aerosol contents and cloud top height. The other imaging instrument is the Sea and Land Surface Temperature Radiometer covering infrared wavelengths and sweeping out a wide field of view to gather surface temperature data over land and the ocean. 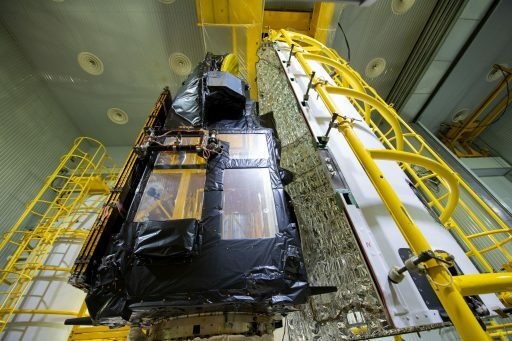 Built and tested by Thales Alenia in France, the satellite was packed up in March and flown to Plesetsk, some 800 Kilometers north of Moscow. Arriving at its launch site on March 17, Sentinel-3B was greeted by snowy weather which caused some hold-ups in the final leg of its journey completed by train. 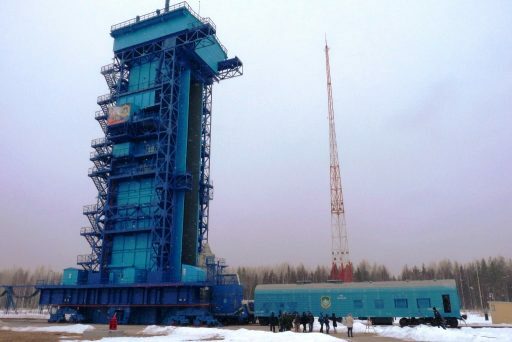 Final testing confirmed the satellite made it to the launch site without problems and was in working order before completing fueling for its planned seven-year mission. 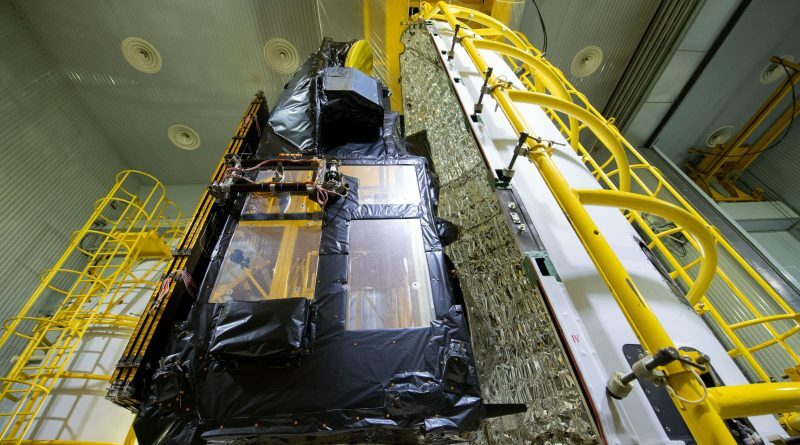 The satellite was mated to its launch adapter on April 14 before taking its position atop the Briz-KM upper stage and being encapsulated in the protective payload fairing. It was then moved to the Site 133/3 launch pad where it was hoisted for installation atop the two-stage Rockot Booster for a final test of checkout activities including a complete countdown rehearsal on Sunday to clear the way for the Launch Readiness Review which gave approval for fueling of the Rockot booster with toxic, self-igniting propellants. On Wednesday, the satellite team at the launch site and the European Space Operations Center in Germany will head into a seven-hour countdown operation to put the Sentinel-3B satellite through final checkouts, configure it for launch and complete data flow checks with the various ground stations involved in the mission. Wednesday’s launch will initially be supported by Russia’s Ground Station Network tracking the ascending Rockot vehicle followed by passes over ground stations in South Africa, Kenya, Belgium and Sweden – supporting launch vehicle telemetry relay as well as communications with Sentinel-3B after spacecraft separation. Final approval from the State Commission is expected six hours before launch and Rockot will head into a series of checkouts. The Mobile Service Tower will be retracted from the above-ground launch canister and, as the count heads into its tail end, the satellite team will provide a final readiness call when Sentinel-3B is on battery power. The final countdown sequence kicks off at T-3 minutes and includes steps to transfer Rockot & Briz-KM to onboard power and pass control over to the launcher. T-0 at 17:57:38 UTC marks the start of final gyro settling and ignition comes at T+11 seconds as the RD-0233/0234 engines on the 1st stage soar up to a collective liftoff thrust of 191 metric-ton-force. Climbing out of its Launch Container, Rockot will ascend vertically for a moment before pitching over to begin heading to the north-west to aim for a polar orbit. Staging at 68 Kilometers in altitude will set the stage for a burn of just over three minutes as the second stage pushes the vehicle out of the atmosphere with a thrust of 25 metric-ton-force. 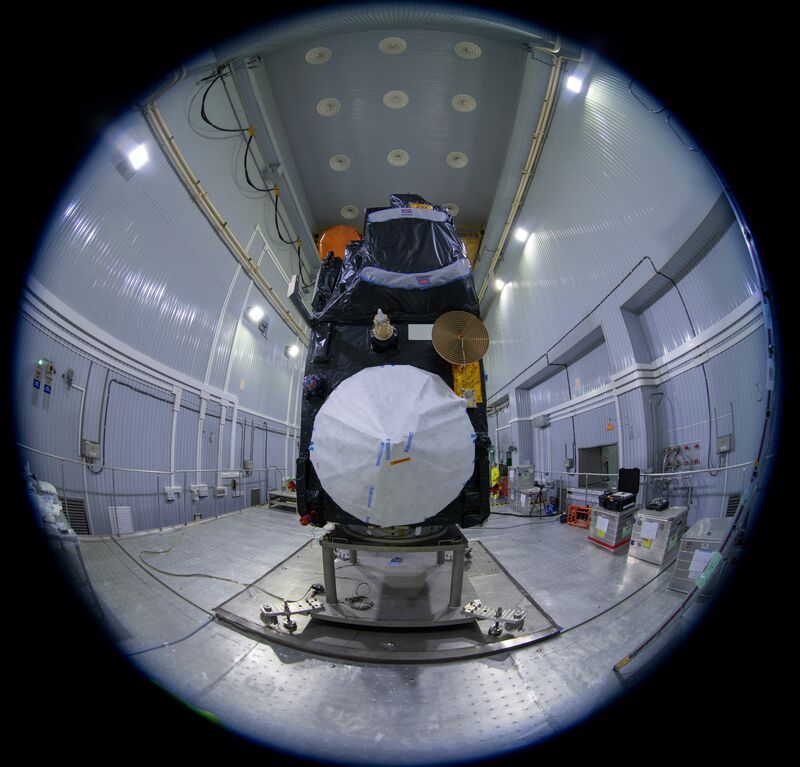 Sentinel-3B is revealed three minutes into the flight when Rockot will pass 121 Kilometers in altitude, well outside the dense layers of the atmosphere where aerodynamic forces are no-longer a concern. After second stage shutdown at T+5 minutes and 19 seconds, the Briz-KM upper stage will be in charge of powered flight. It will start with a burn of just over nine minutes, firing its S5.98 engine with a thrust of 2,000 Kilogram-force to boost the stack into an elliptical Parking Orbit of around 153 by 785 Kilometers. Once arriving in orbit, the stack will enter an hour-long coast to climb to the apogee of its orbit so that the second burn can bring up the perigee and circularize the orbit. While coasting, the vehicle will pass over the Hartebeesthoek, and Malindi ground stations, covering the second burn and spacecraft separation. Briz-KM’s second burn is set to start one hour and 15 minutes into the flight and last around 33 seconds to put the vehicle into an orbit of 809 by 811 Kilometers, inclined 98.65°. Following separation 80 minutes after launch, Sentinel-3B will be tasked with establishing a stable orientation, deploy its single solar array and check in with ground stations to deliver health data to teams at ESOC, marking the start of a three-day initial commissioning phase. For Briz-KM, two disposal maneuvers are coming up after satellite deploy to lower its orbit.